We are now offering limited quantities of our duck eggs for sale by the dozen here at the farm. If you are interested, please contact us ahead of time to confirm availability, and make an appointment for pick up. The current price is $12 per dozen, though this may vary seasonally. Why $12 a dozen? Our duck eggs are organic, GMO-free and soy-free. 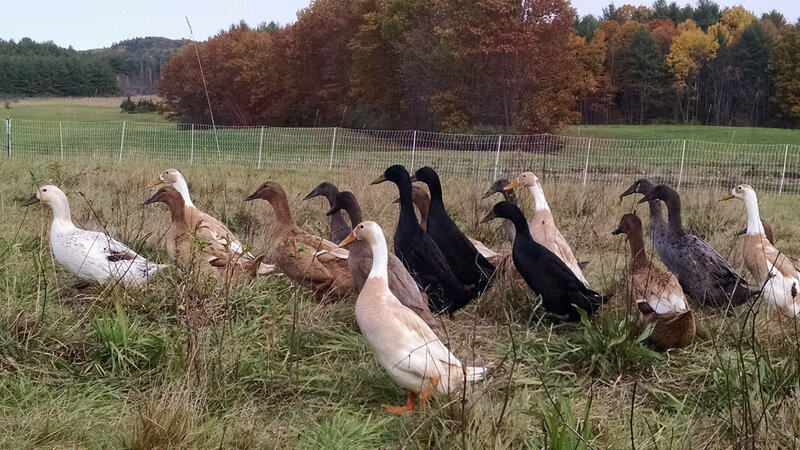 During the growing season, the ducks spend their days foraging out on pasture, in paddocks that we move around from week to week. 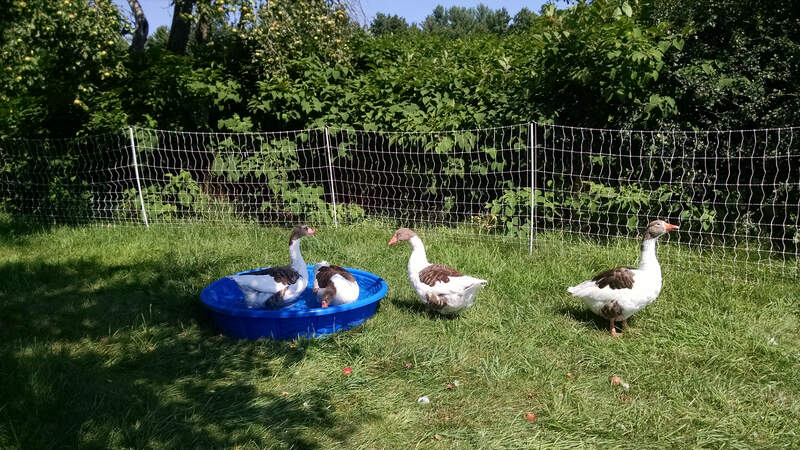 This is an expensive, labor-intensive method to raise ducks. However, we feel strongly that it is the best approach to bring you wonderful eggs, while at the same time keeping our ducks and landscape healthy. For more information on how we handle the ducks, please see our description elsewhere on our website. Don’t hesitate to contact us if you have questions or need more information. A lot of the goings-ons this season have been focused on refining and streamlining our how we rotate the birds to different paddocks. The most recent step we have taken in this project has been to pull the geese out of the duck paddock, and give them their own space. This will allow us to better utilize their grazing in managing our pasture. It’s early yet, but it also seems like both species appreciate the move– everybird is much quieter now! I’ve only got the one. And I am pretty pleased about it. We raise our birds on pasture. As you might expect, we spend a lot of time squinting at the field, trying to figure out what’s growing where, and how to manage it. Maybe a month or so back, I spotted a little, lone green mound rising above the rest of the grasses which surrounded it. So I checked it out and have been watching it every since. And it’s pretty. Plus, it fixes atmospheric nitrogen and pumps phosphorus up from down deep in the soil. So when the plant tissues ultimately break down, they improve the soil. It’s good for bugs too– with nectaries as a food source, it also provides shelter for lacewings and parasitoid wasps. No, not that kind of outlet. Those are in Kittery, not Kensington. We just wanted to pass on the news that Heron Pond Farm Stand on Main Avenue in South Hampton has added our eggs to their shelves. They also carry fresh vegetables, a variety of locally-made products like cheeses and body oils, as well as seedlings for getting that garden rolling (we have some representatives of their handiwork in our own garden this year). So pay them a visit, spend some money and support your local farmer-entrepreneurs! Spring is well upon us, and after a long Winter the flock is back out on pasture. This is their second week out there, and they’re still pretty excited about it! It’s an exciting time of year for us too! We’ve planted a few persimmon trees, a handful of apple trees, a whole mess of Siberian pea shrub (a nitrogen fixer for building soil quality) and are expecting a bunch of hybrid hazels later in May. This is on top of getting the vegetable garden going, renovating the blueberry plantings and trying to stay on top of the usual goings-ons of family life with small children. Hectic? Yes. And, we wouldn’t have it any other way! More places to eat our eggs! We are delighted to report that over the past few days, two more restaurants have started serving our eggs– Stages at 1 Washington in Dover and, Martingale Wharf in Portsmouth! It’s been exciting talking with chefs on our deliveries about how they are putting our eggs to use– so many great flavors! We’re not giving away any hints here though! You’ll have to pay their establishments a visit and see for yourself what they are up to. Our eggs are now available from our neighbors down the road at The Farm at Eastman’s Corner in Kensington! 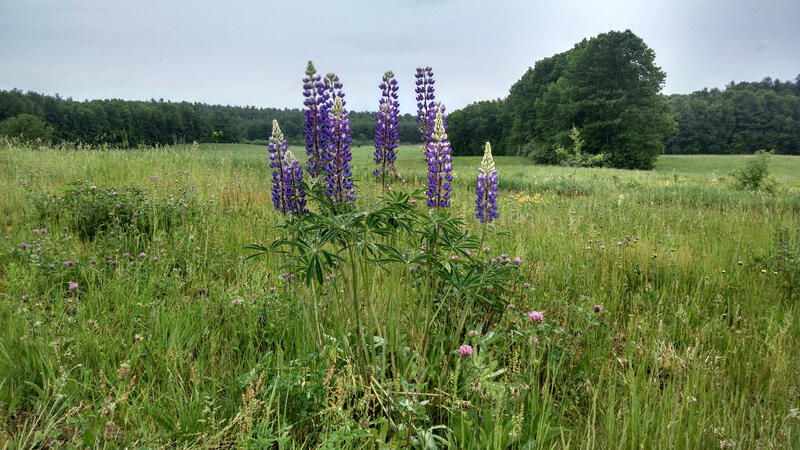 Providing a retail outlet for locally grown produce, meat and eggs, dairy products and prepared foods, these folks do a great deal to support the agricultural renaissance in northern New England, as well as our own town. Check them out. There are lots of production systems for raising poultry. There are many ways to classify these system, including (but not limited to): demand for inputs (such as technology, fuel, feed, expertise) from beyond the farm system; resilience with respect to flux in the environment or availability of inputs; how well the system is integrated into, and supports, associated ecological and social systems; profitability in financial terms, as well as with respect to other forms of capital. You might think of them as sort of a continuum from large-scale, industrial farming to birds running wild in the bush (“free range”). However, we do not plan to offer a complete picture of the diversity of poultry production systems here, just a discussion of our own. For a better developed taxonomy of poultry management systems, as well as a polemic on the author’s favorite system (which happens to be paddock shift), see Paul Wheaton’s Raising Chickens 2.0 essay. So how do we manage our birds? We manage a day-range, paddock shift system. 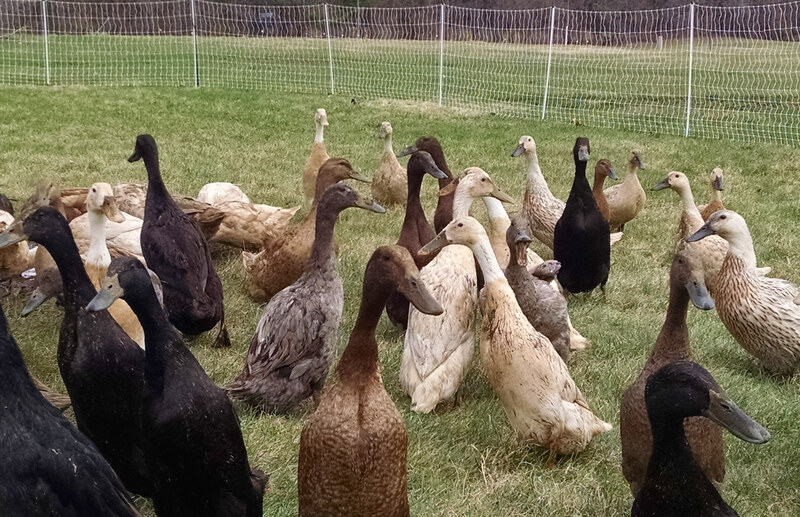 During the day, our birds stay out on pasture where they forage for their food, including grasses and other pasture plants, seeds, bugs and whatever else they can catch (first and foremost, ducks prefer to eat critters like bugs and slugs, plants are a second choice). Rather than turning the flock loose to roam over the entire area, the pasture is sub-divided into paddocks. In each paddock, we provide them shade and water for drinking and bathing. The flock spends between 7 and 14 days in a paddock. By then, the plants in the paddock are pretty well grazed down or trampled, and the paddock is well manured. So it is time to move the flock to another paddock. This gives the birds access to fresh greenery and invertebrate prey. It also gives the paddock a chance to recover and to benefit from all that manure before the birds visit again. In refined paddock shift systems, productivity of both birds and pasture plants is maximized. Ideally, labor is minimized. This is our first year raising waterfowl, so we’re still working on it. We tweak how we time paddock movements, layout our paddocks, manage pasture vegetation to improve plant diversity and flock nutrition, and stuff like that. There are plenty of variables to observe and manage. “Day-range” refers to where the birds spend the night. In day range systems like our, the birds spend the night in a stationary duck house. Every morning, we turn them out and they follow a fenced-in corridor down to the paddock, where they are closed in for the day. Late in the afternoon, we let them back up to the coop. Our birds putter around the poultry yard around the duck house until nightfall. They all then file inside for bedtime. After dark, we give them a final check and close them in for the night. This system is very secure. Should a predator penetrate the electro-net fencing at night, they would still have to get into the duck house to do any damage. It also keeps a lot of our labor demands close to the house (and kids). We don’t need to travel far to clean the duck house, collect eggs and perform other duck chores. The system does however, demand a lot of fencing (i.e. expensive to establish) and it limits how we can lay out our paddocks. 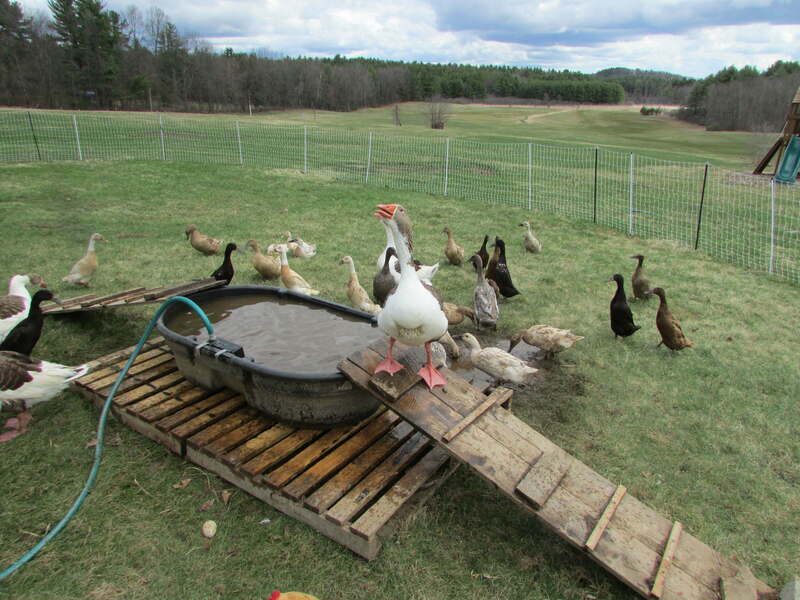 This can all be contrasted with mobile housing systems, like the “Eggmobile” mobile coop system popularized by Joel Salatin, in which the duck house would move along with the paddocks. A mobile duck house would allow more flexibility in paddock layout, and would eliminate the need for a morning and evening commute for the birds. But it would change how we work and where on the farm we are working, which can be tricky to coordinate with wrangling small children. We’re looking into it. Duck Eggs on the Menu! If you’re going out to eat this weekend, we would like to encourage you to visit our friends at The Joinery in Newmarket and Blue Moon Evolution in Exeter. Both are top notch eateries and source many of their ingredients locally. And this now includes pasture-raised duck eggs from The Emergent Farm! So head on over for a meal, and tell them you’re there for the duck eggs! AgriTrue: what’s it all about? Buyers of our retail packages will notice a QR code prominently displayed on the label. This QR code links directly to our farm profile with AgriTrue. AgriTrue is a relatively new project conceived as an alternative to government-run organic certification programs. We see the formal, USDA-policed organic certification process as a costly hassle, with standards which are drifting further and further away from how we want to farm. We are exploring AgriTrue as something of an alternative– something to include on our label so potential customers will know a little bit about our farming practices with simply a glance. However, the program is new and not yet widely known. 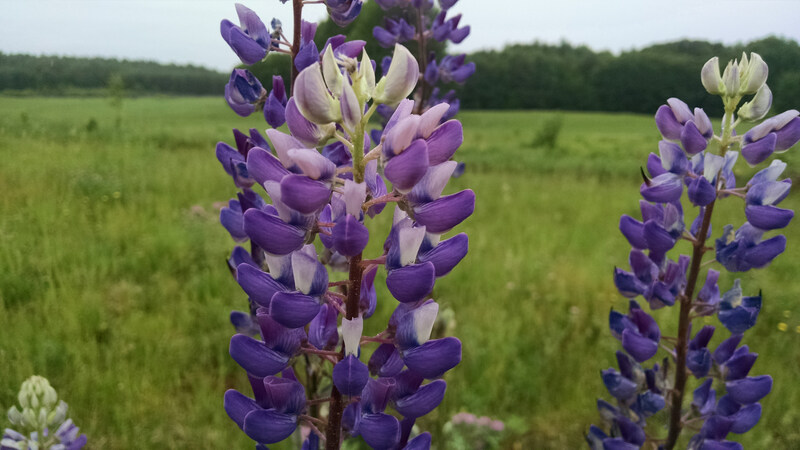 We like the project because it positions itself as a hub for producers who voluntarily commit to openness and to not use synthetic chemical inputs or GMOs. Being open and honest about their production practices is not new for many smaller-scale farms (just ask the folks at the farmers market). However, it does contrast with the trend in large-scale, agricultural operations towards secrecy. In some cases, this secrecy is even legally protected. A producer registering with AgriTrue is making a commitment to open, honest communication about their products and production methods. Not to use synthetic herbicides, pesticides, fungicides, or fertilizers in the production of the food I produce, and the feed I give my animals will be raised without synthetic herbicides, pesticides, fungicides, or fertilizers. Not to raise Genetically Modified Organisms (GMO), and I agree not to use Genetically Modified (GM) feed for my animals. This works for us. If you have a question about what we’re doing, just ask! If you are a producer, consider enrolling. If you are a consumer, keep your eyes peeled for more AgriTrue producers in the future. You can also seek them out using the search tool on the AgriTrue homepage. At 27 weeks of age, the birds are laying pretty well now. The eggs are white or blue-green, and are running about 2-3 ounces each. We still find an occasional little pea or monster triple yolk quarter pounder, but the eggs are much more consistent than they were when they first started laying 10 weeks ago. Copyright © 2019 The Emergent Farm.